Aaron Sinift (b ’66) is an artist living and working in Beacon, NY. He has a BFA in painting from University of Iowa (96′) and an MFA from Boston University. He instigated the 5 Year Plan project 5 Year Plan.org to engage with Gandhi ashram khadi collectives to deepen his understanding of life in India from the perspective of Gandhian service, which he found to be life changing. He lives with wife Greta Byrum and 4 year old son Orion. 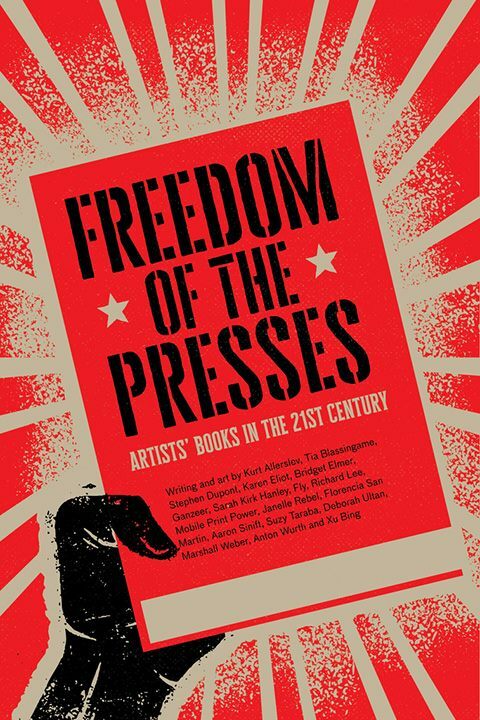 “Weaving Stories: Artists in collaboration with Gandhi Ashrams” is to be published as an article in the forthcoming book Freedom of the Presses: Artists’ Book in the 21st. Century. It is a personal reflection. It explores how the idea of a 5 Year Plan book was conceptualised and how Gandhian ethics and economics underpin the project. It then goes on to present the evolution of the first two books, 5 Year Plan and Other Imaginings. The article is published here as a 5 part series. I then went to Jaipur to meet Tarun’s wife Nandita Devraj at her company Rudraksh to see if we would be able to work together. I liked her immediately, her strength and fortitude did not obscure her sharp humour and insightfulness. Over the next four and a half months of working together we came away with a deep respect and friendship. It felt strange to learn that Tarun and I had been born within an hour of one another on May 4, 1966, at the same latitude on opposite ends of the world, reminiscent of the 5 Year Plan project logo which depicts twins standing together blowing horns upon a globe. Once it was clear that Nandita would print and bind the book, it became necessary to find the appropriate khadi cloth, approximately 1400 meters of it. My next stop was meeting Mr. Handa at the Gandhi Hindustani Sahitya Sabha (GHSS) next to the Gandhi Museum in New Delhi. It is a pleasant two story building within a compound surrounded by a wall & gate next to a very busy thoroughfare. Inside it is an oasis of calm, the school downstairs serves children from the community during the day, and, in the evening hosts theatrical rehearsals and music lessons. Mr. and Mrs. Handa live upstairs and that is where I met them on a sunny afternoon with children running around. I liked them at once, my heart rate slowed, and they showed me examples of khadi they had on hand and agreed to take me to the khadi ashrams that had produced them. The next day we drove north of Delhi to Meerut, Modinagar, and Pilkhua to meet ashram workers and see what kinds of khadi they had available. These are very old institutions, dusty and quiet, ancient like in Pasolini film. In Meerut we spoke with a very stoic elderly man, I could see that he didn’t quite understand why we were there so I showed hem my sketches for the book, explaining that we were not there for cheap cloth but we want to honor Gandhi’s khadi program. Looking into his face I could see understanding and that his eyes were slightly wet. Today khadi is so forgotten and so undervalued in India that it no longer receives the respect it once had. Once khadi was seen as a proud living symbol of Indian Independence and self-sufficiency; khadi was Gandhi’s promise to the people that struggled for independence that they would create a society that served its most vulnerable and protected the “soul of India (which) resides in its villages.” This man, and many more like him, have served this dream since the 60’s and 70’s, despite government corruption and systematic de-funding. Now in India there is the dismantling of socialist institutions in favor of American style “free-market” competition which pits village khadi collectives against imported factory synthetics which are dumped into the Indian market place. The khadi ashrams face a future where Gandhi’s dream of village self-sufficiency is being abandoned in favor of day-labour displacement into mega-slums. These ashrams workers are the last hold outs of Gandhi’s pastoralist vision. 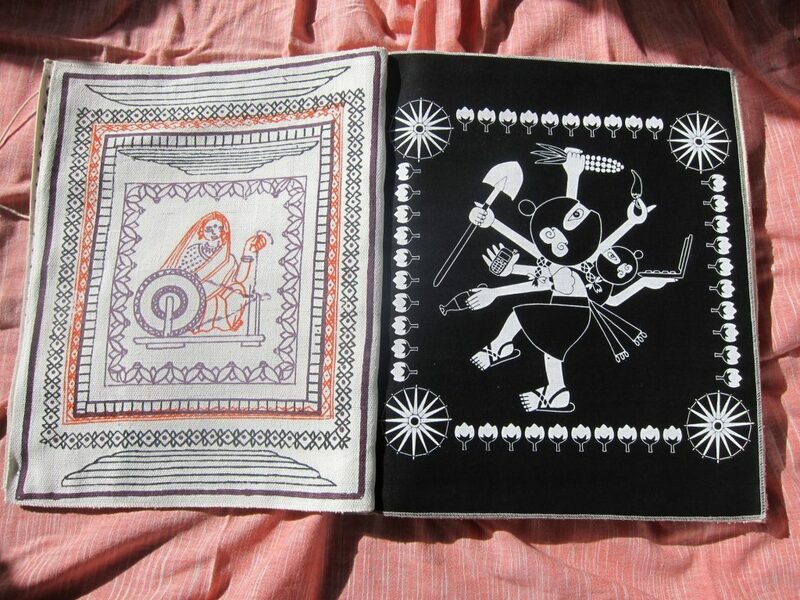 by Rudraksh, Jaipur; both printed on khadi cloth. We found the particular khadi we needed at the Manav Seva Sanidhi (People’s Service Society) in Pilkhua, which Karan Singh, the founder, described as “no profit/no loss service enterprise”. They did not have the specific khadi on hand so they would have to weave it. I commissioned 1400 meters of homespun /hand loom khadi cloth, 48″ wide, to be woven for the book. It would take approximately 2 months to spin over 1,300,000 miles of home spun yarn and weave it into almost 0.9 miles of hand loom cloth of the type that Gandhi himself wore. I paid a deposit and they agreed to ship the first batch in a few weeks to Nandita in Jaipur. In the meantime it was my job to design & refine the book, compose the pages, edit the “5 Year Plan Library Companion” book, and arrange color separations or make them myself. I also set myself to reading Gandhi, whom I had actually never read until I got to India. Mr. Handa had also insisted that I learn to spin cotton into thread so I spent a fair amount of time at the ashram getting schooled by the kids there. In April I slipped away to go to the Kumbh Mela in Haradwar to bathe in the Ganges with several million people on the New Moon, (suffice it to say that it was a profoundly intense and internally transformative experience of humanity). Back in Jaipur, we printed each page as the khadi came from the ashram, slow and steady we worked through the 120 degree heat of Rajasthani summer, until finally in Mid-June I had done all I could, submitted all the necessary elements to Nandita for final book printing and binding. As a form of pilgrimage, I took off with my friends Janna Rose White & Jeremy Cheney to hike deep into the Himalayas up to the glacier source of the Ganges, bathed there and gave thanks for opportunity to realize this crazy dream. Back in the US with 80 copies of the finished book, and another 100 to follow in the post, the work began to complete an edition signed by all the artists (100). The artists being in 4 separate countries, our solution to this problem was getting bits of cloth signed and matching them on their appropriate pages. We sent our the approximately 60 copies for the artists & helpers and subscribers who had pre-purchased copies, as well as promoting and selling the project. I gave myself 10 copies and maintained myself with the proceeds to keep me working. By the following winter 2011, 5 Year Plan had donated $5000 to Doctors Without Borders. Later that year Google NYC commissioned us to make 1000 jholas, and the following year we were invited to do another 1500 Google NYC jholas. In total both projects required 2000 meters of homespun khadi, which created 1800 days of work for spinners, and another 200 days employment for printers and tailors. 5 Year Plan made no profit at all.